Now that my hair is waist length I'm having to give it a little more care and attention than I have in the past. When you have long hair, washing and drying becomes a massive bore, which means the rest of my hair care routine needs to be quick; I need a snappy routine with no messing around. I use a liberal amount of heat protection in the form of the ghd Heat Protect Spray* and the Charles Worthington Strength and Repair Split Ends Binder while it's damp to protect against heat and tame any split ends. If I have time, I'll air-dry or else I use the Vidal Sassoon Infra Radiance Diffuser Dryer* which distributes heat more evenly and maintains the natural moisture balance and reduces frizz. Since using this I've found my hair is a lot more manageable and less damaged after blow-drying. If I'm styling my hair, I use the ghd Curve Classic Wave Wand* The 38mm – 26mm oval barrel allows you to create deep waves, rather than curls, which holds for days. This curling wand makes it super easy to create beachy waves perfect for daily styling or more sophisticated loose curls for the evening. I don't like my hair to look too "done" - messy waves are what I'm after. I tend to curl my hair neatly and then over the next couple of days work the style into messy, wavy, super relaxed curls. The ghd Curve Classic Wave Wand adds movement without the drama of perfectly curled hair and I can't recommend it enough if you're looking for a more relaxed styling tool. To hold style I use the Charles Worthington Style Setter Long Lasting Max Hold Spray and the Charles Worthing Shine Booster All Over Gloss Spray adds a glossy shine and smoothes out waves. 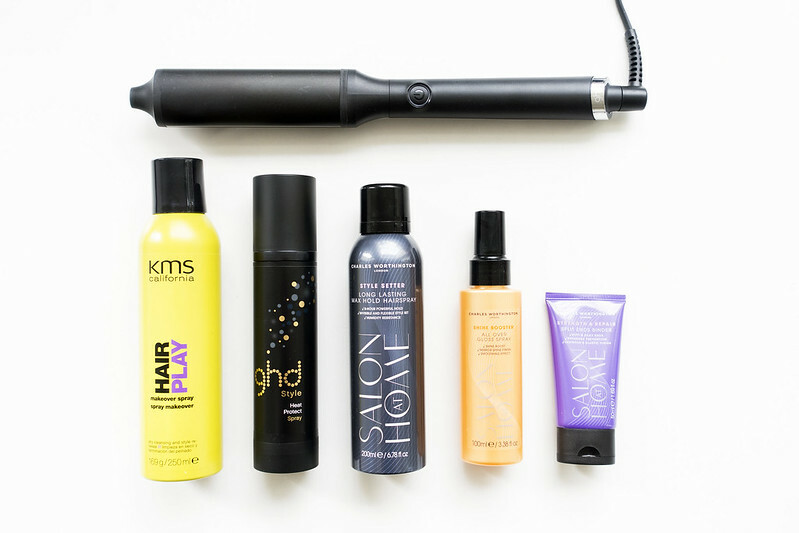 We all know that feeling of not wanting to wash our hair, so I always keep a bottle of my favourite dry shampoo around - the KMS California HairPlay Makeover Spray. The is the best dry shampoo/"style refresher" I have ever found, it absorbs oil, doesn't look chalky on the hair, rubs in quickly, and it smells pretty good too - I can't recommend it enough. The ghd curve sounds great - I will have to put this on my wishlist! Using heat protection is really important, a lot people think you should only use it when using a flat iron, but even heat from a blow dryer and ruin your hair, now I tend to let my hair air dry it has never been healthier. Absolutely - I always put it on before blow-drying. The ghd heat protection spray is awesome, my hair feels fantastic after using it. It's AMAZING and I know it's easy for me to say because I got it for free BUT I honestly think it's worth every penny. The Curve Wand creates such awesome beachy/messy waves - I love it.